Howard Hanna knows that the communities where our team works and plays are top in the nation. Now, Business Insider agrees! Franklin Park and Mount Lebanon have been named to its list of top places to live in the United States. Franklin Park is one of Wexford’s four municipalities and home to a Howard Hanna office as well as a team of qualified real estate agents. Money magazine ranked the area as the “28th Best Place to Live” in 2005. In 2006, they retracted it from the list, and Trib Live subsequently published a humor article titled “Unreal! Wexford bounced from list” that highlighted the locals’ pride in being residents of Wexford. The area was named after County Wexford in Ireland. Wexford is a booming place for employment, with a commercial landscape featuring corporate chains, car dealerships, local small businesses, and more, all focused around Route 19, the main thoroughfare of Wexford Flats. As Wexford is continuously growing, with an increasing number of subdivisions and neighborhoods, Route 19 was expanded to serve the increasing population. The easy access to Pittsburgh and great schools within the area make Wexford a favorite location for professional athletes, celebrities, and medical and university personnel. Though the area is often defined by its commercial successes, the residential areas are suburban and surrounded by local farms and rolling green hills. Local attractions include North Park and the North Park Lake adjacent to Wexford, which offers hiking and biking trails, a paved five-mile running path around the lake, pavilions, an outdoor ice rink, a golf course, dog parks, various playgrounds, a C.O.P.E. course, and even restaurants and shops. The North Allegheny Senior High School in Wexford is considered one of the top high schools in the state, with a student-to-teacher ratio of approximately 13:1 and an education system that caused the Pittsburgh Business Times to rank its 11th grade as “3rd out of 104 Western PA High Schools” in both 2012 and 2013. Due to being comprised of four municipalities, Wexford also includes Pine-Richland High School from the Pine-Richland School District, Marshall Middle School, and Wexford Elementary School, along with Vincentian Academy. 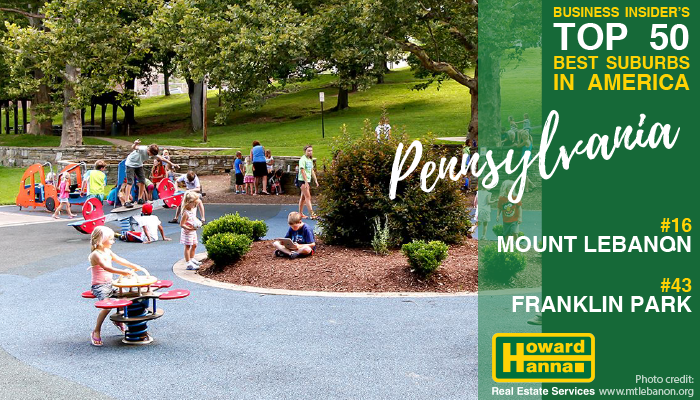 Situated within six miles of downtown Pittsburgh, Mount Lebanon offers a great blend of urban and suburban living, in addition to being home to one of our flagship Howard Hanna offices. It is easily accessible by public transportation, making it a very desirable neighborhood for decades. The Mount Lebanon School District has been nationally recognized for providing outstanding educational services to its students and is made up of seven elementary schools, two middle schools and a senior high school. Residents enjoy strolling several business areas complete with coffee shops, galleries, spas and restaurants. A recreation center in the main park is open for ice skating, tennis, paddle tennis, swimming and much more. All school properties have meticulously maintained facilities and fields to support various sports, including track, soccer, lacrosse, football, basketball and baseball. An award-winning public library with a huge array of activities, in addition to countless available resources, serves the residents of Mt. Lebanon. The community also contains a beautiful golf course. Mount Lebanon is known for its abundant green space, mature trees, sidewalks, playgrounds and parklets sprinkled among the established neighborhoods. Mt. Lebanon’s slogan, “A Community with Character,” refers to the eclectic architecture and distinctive neighborhoods, as well as to the residents, who represent diverse ages, backgrounds and interests, but are united in their desire for good quality of life. Ready to buy in Wexford or in Mt. Lebanon? Our professional and knowledgeably staff is here and ready to help! Want to read the complete national list of great places to call “home”? Click here!